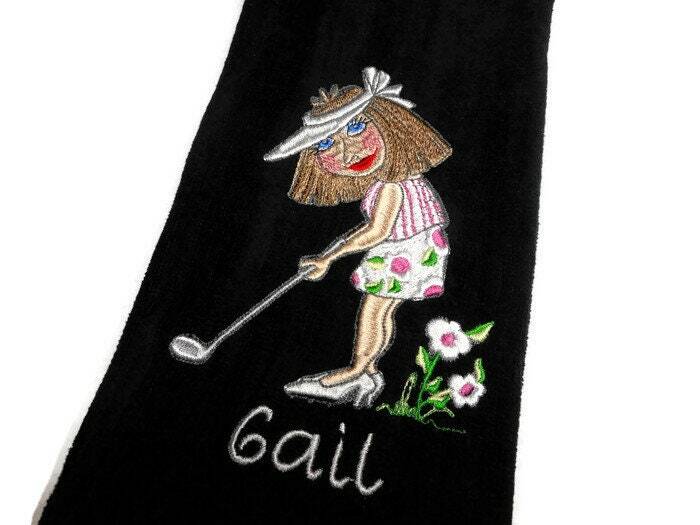 Golf towel for a lady golfer makes a great gift. Customize the hair color at no charge. The large towel is made of 100 percent premium plus cotton with plush velour finish. The embroidery design is very high quality and can be customized. The design measures approximately 6.5 X 4.5 inches. This towel can be personalized to make it even more special. If you choose that option, please leave the name in the note to seller box during checkout. If you would like a hair color change, please leave the color needed in that same note to seller area. Generous size measures 16" x 26" and has a top center gold brass colored grommet and hook. The towel also comes in other colors. This towel is perfect for Mother's Day, birthday gifts for her, golf lovers, retirement gift, etc. Very cute graphics, nice towel. I would have preferred if the hole for hanging was in the middle of the towel because it hangs too low on golfbag.